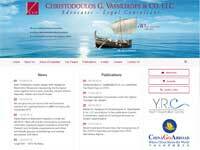 Christodoulos G. Vassiliades & Co LLC (CGV) was founded in 1984 and has successfully maintained a reputation of excellence and due diligence throughout.Today, it is internationally acknowledged as a top-ranking law firm in Cyprus. Christodoulos G. Vassiliades & Co LLC offers the expertise of 150 professionals including qualified advocates, legal and tax consultants,paralegals and accountants, all committed to catering for client needs with professionalism, integrity and proficiency. Although CGV is based in Nicosia, it has a significant national and international reach with a branch office in Limassol and representative offices in strategic locations like Moscow, Belize, Malta, Seychelles, Athens and Budapest. Moreover, the Firm retains solid relationships with other well-known law firms and is a member of prestigious professional associations. A complex network is therefore created, equipping CGV with the infrastructure to support cross-border transactions. CGV specialises in an array of fields including Corporate and Commercial, Contractual Drafting, M&A, Banking and Finance, Shipping, Tax and International Tax Planning, Migration, Intellectual Property,European and Competition, and Dispute Resolution. (fora complete list of our practice areas kindly access www.vassslaw.com).